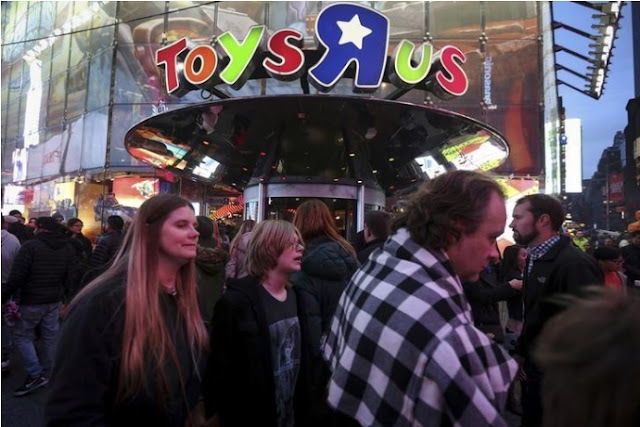 FILE PHOTO: People walk past Toys R Us in Times Square the day after Christmas in the Manhattan borough of New York, U.S., December 26, 2015. Toys “R” Us Inc has been making $400 million in interest payments on its debt every year, largely due to its $6.6 billion leveraged buyout in 2005. This week, it succumbed to its debt burden, leading to the biggest bankruptcy of a U.S. retailer since that of Kmart in 2004. But company’s ability to kick the can down the road had been exhausted. The bankruptcy filing was the culmination of an unsuccessful seven-month effort by Toys “R” Us to find relief from its $5.2 billion debt pile, according to bankruptcy court filings and people familiar with the deliberations. The Wayne, New Jersey-based company’s creditors’ unwillingness to show any more leniency underscores the lack of confidence by investors in the troubled brick-and-mortar retail sector, which has been pummeled by the rise of e-commerce companies such as Amazon.com Inc.
For example, Bon-Ton Stores Inc, another retailer in financial distress, completed a similar deal last week, generating $18.9 million to pay down its debt. At that point, Toys “R” Us decided to change tack and initiate preparations for a Chapter 11 filing in September, ahead of the quarterly earnings release on Sept. 26. News reports about the possible bankruptcy on Sept. 6 accelerated bankruptcy preparations, because suppliers to Toys “R” Us curbed their shipments, afraid they might not be repaid, according to the filings. Private equity firms KKR & Co LP and Bain Capital LP, together with real estate investment trust Vornado Realty Trust, took Toys “R” Us private in 2005. On Monday, they all supported the company filing for bankruptcy, according to the sources.